A beautifully restored 300 year old Portuguese era manor house that once belonged to a governor of Macau, Siolim House is now a unique boutique "Heritage" Hotel in Goa, unlike other hotels. When we decided to restore the house in 1996, Siolim House's future looked bleak - for five years it had fought a losing battle with the Goa monsoon (see the before and after photographs). A family's history seemed to be fading away, and like so many other elegant homes, it would see its end. But over three years, without sparing any detail, from its lime plaster to its patterned floor tiles, the house was lovingly brought back. 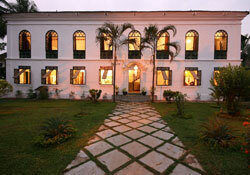 Siolim House is still a private home, and we hate to call it a hotel. The entire restoration of Siolim House was done with a view to it being a home, and therefore we were very generous in our use of space. In a building that had twenty four rooms there are today only seven suites and seven bathrooms. No necessity was felt to cram rooms in, and so we have spacious public areas and rooms. We realised several years after the restoration began that welcoming guests in a "hotel de charme" would help us keep Siolim House in perfect shape, and give it the character that comes with welcoming people from all over. That way we also did not have to worry about the Goan monsoon storms that had wreaked so much havoc on the house when we decided to take on the enormous restoration job. Telephone, E-mail, Excursions, Tailormade itineraries to discover the area, A car with driver and Honda scooters are available at an extra charge, Yoga classes off site, Ayurvedic treatments from trained people available on call, Baby sitting, Massages, Barbeques, 12.5 m lap pool with children's area, Cycles for use at liberty, Walks, Trekking and Excursions. The house has seven bedrooms (including two suites) named after trading ports/areas of the 18th century mostly along the Konkan coast where Goa is located, during the time Siolim House was at its prime. Each room or suite has attached tastefully designed large bathrooms. There is a large garden with bursting bougainvillea bushes and fragrant trees and a pergola in what we call the "secret garden", a fully equipped kitchen, an inner pillared courtyard with a mosaic fountain and a part that even has a stepwell that provides water for the house. There are several large halls, and an 12.5 meter overflow swimming pool, great for laps!